Champagne Lanson has just announced that they are the new official Champagne of the Royal Shakespeare Company (RSC). The Royal Shakespeare has over one million visitors each year and they will now be pouring Champagne Lanson’s exclusive Père et Fils as well as its Vintage Gold Label 2008, its Extra Age Brut NV and its popular Lanson Rose Label Brut Rosé NV in all of its bars and restaurants. The company operates three theatres in the market town – The Royal Shakespeare Theatre, The Swan Theatre and The Other Place – as well as four bars and restaurants including Rooftop Restaurant, Susie’s Café Bar, Riverside Café and Swan Café. “Sold by the glass in every theatre bar, the delicious Lanson Père et Fils Brut NV is the perfect aperitif to complement a theatre visit, while a bottle of Lanson Gold Label Vintage 2008 goes wonderfully with a special event at our award-winning Rooftop Restaurant. Lanson Brut Rosé NV, Lanson Extra Age Brut NV and Lanson Gold Label Vintage 2008 will all feature on the Rooftop wine list”. Paul Beavis, managing director of Champagne Lanson, added: “We are absolutely thrilled to be partnering with the Royal Shakespeare Company. 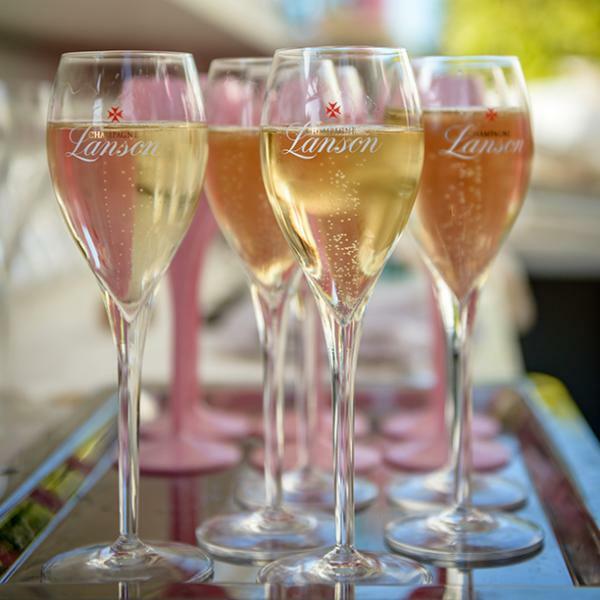 It not only allows us to showcase our multi award-winning range of Champagne to its members; but we are also convinced that Lanson’s renowned freshness and added weight from extended aging ensures that our style of Champagne is also food-friendly. Global wine output for 2018 rose 17% to 292.3 million hectoliters (mhl) which was close to the exceptionally high level of 2004, driven by Italy, France, and Spain. These three countries recording output at least 13% above their five-year averages states Roca. 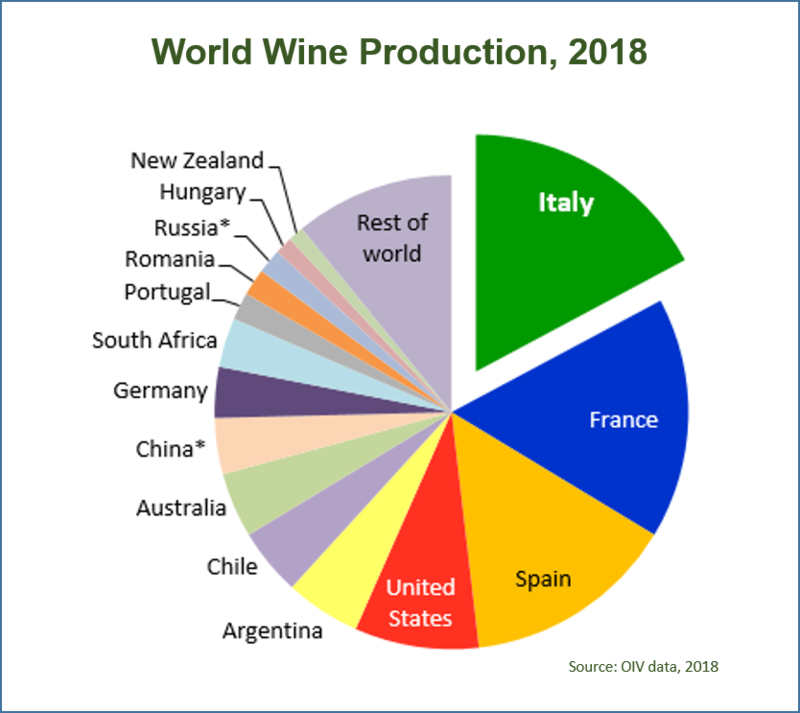 Italy confirmed its position as the world’s largest producer with 54.8mhl, followed by France with 49.1mhl and Spain, which produced 44.4mhl. In the US, wine production in 2018 increased by more than 0.5mhl compared with 2017, with production in Argentina growing 2.7mhl to reach 14.5mhl. Chile recorded a 3.4mhl increase to reach 12.9mhl. Brazil saw its production fall to 3.1mhl in 2018. South Africa produced 9.5mhl in 2018 – a 1.4mhl decrease compared with 2017 due to the impact of the drought. Britain recorded a 3.1% drop in consumption to 12.3mhl, while mainland China recorded the biggest decrease in consumption among the world’s top 20 largest wine consumers, down 6.6% to 18mhl. The slight decrease could be due to extreme weather in Europe, including drought and storms. Australian production remained stable, with 12.9mhl vinified. New Zealand produced 3.0mhl, an increase of 0.2mhl since 2017. In terms of global consumption, 246mhl was consumed in 2018 compared with 246.7mhl in 2017, the OIV estimated, adding estimates were tentative due to limited data. Global trade in 2018 increased slightly in terms of volume, with 108mhl traded; it also rose by 1.2% in terms of value, reaching €31.3 billion. Wine exports in 2018 continued to be largely dominated by Spain, Italy, and France, which together accounted for more than 50% of the global market by volume, equating to 54.8mhl. Spain continued to be the biggest exporter by volume with 20.9mhl, representing 19.4% of the global market. France was the biggest world exporter by value, with €9.3 billion exported in 2018. Bottled wines made up 70% of the total value of wines exported in 2018. By value, sparkling wines accounted for 20% of the global market, despite representing just 9% of the total volume exported. The OIV the total world area under vines at 7.4mha, which is almost equivalent to that of 2017. This traditional afternoon tea is surrounded by over 300 years of royal history. A few weeks ago, I spent the afternoon with my daughter and daughter-in-law devouring a lovely selection of finger sandwiches, tea cakes, scones, jam and clotted cream. 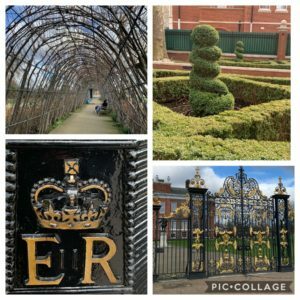 We chose the ever-popular Earl Grey Blue Flower tea and a flute of champagne to sip while overlooking the manicured gardens at Kensington Palace. We all had a taste of what it’s like to be a royal! Great experience and highly recommend it. Prior to the introduction of high tea into Britain, the English had two main meals: breakfast and dinner. By the middle of the 18th century, dinner for the upper and middle classes had shifted from noon to an evening meal served at a fashionably late hour. This did not suit the Duchess of Bedford, Anna Maria Stanhope (1783-1857). She seemed to suffer from ‘a sinking feeling’ at about four o’clock in the afternoon. 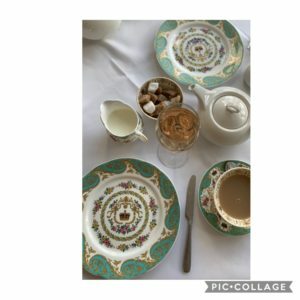 At first, the Duchess had her servants sneak her a pot of tea and a few bread stuffs but then began inviting friends to join her at five o’clock in her rooms at Belvoir Castle. The menu centered around small cakes, bread and butter sandwiches, assorted sweets and, of course, tea. The summer practice proved so popular that the Duchess continued it when she returned to London and high tea was quickly picked up by other social hostesses. Total volume of Champagne shipments declined by 1.8% in 2018 to 301.9 million bottles, with a total turnover reaching €4.9 billion – 0.3% higher than in 2017. As reported by the Comité Champagne at Prowein today, exports of Champagne are on an upward trajectory, rising by 0.6% in volume and 1.8% in revenue. In Champagne’s more traditional markets of France and the UK, which together account for 60% of total sales, volumes dropped by around 4% each, while by value turnover slipped by around 2% in both markets. The UK market, which remains the largest export market by volume, imported 26.7m bottles in 2018, a decline of 3.6%, while value reached €406.2m, a drop of 2.2% – making it the second biggest export market by value after the USA. However, demand is most dynamic beyond the European Union. The USA, which remains the biggest export market by value and second biggest by volume, saw exports rise by 2.7% to 23.7 million bottles. To Japan, exports increased by 5.5% to 13.6 million bottles, while exports to the “Chinese triangle” (mainland China, Hong Kong, and Taiwan) increased by 9.1% to 4.7 million bottles. Following very significant growth over the past decade (+134%), Australia saw imports of Champagne dip slightly, by 1.8%, to 8.4m bottles, which was attributed to a “less favourable exchange rate”. 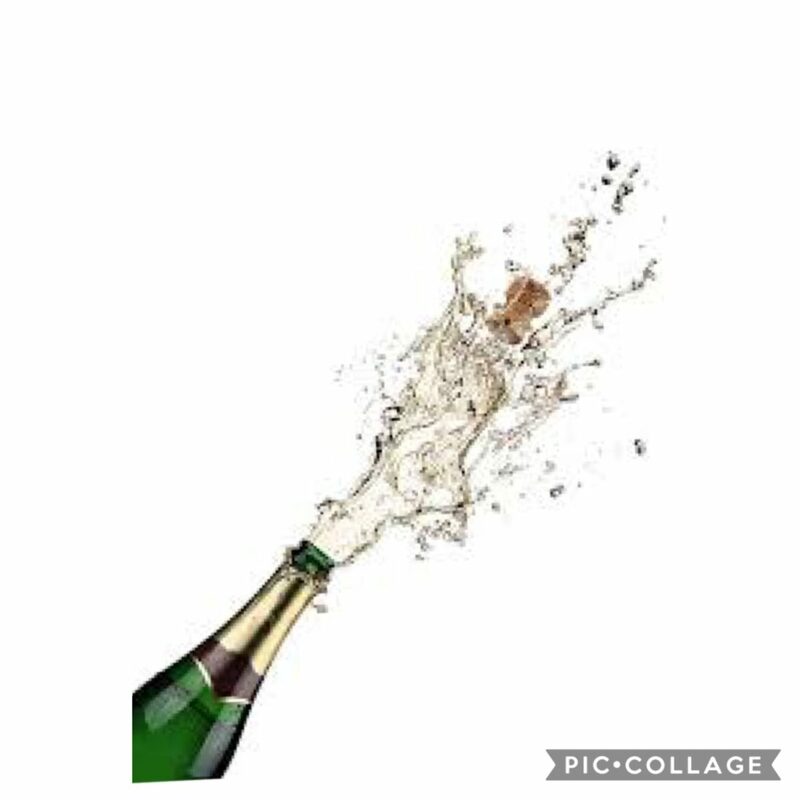 Other countries are emerging stronger for Champagne, including Canada which increased its imports by 4.8% to 2.3 million bottles, Mexico by 4.3% to 1.7m bottles, and South Africa, where sales topped the million-bottle mark for the very first time, recording growth of 38.4% by volume and by 43.4% by value – the highest increase of any market on both counts. 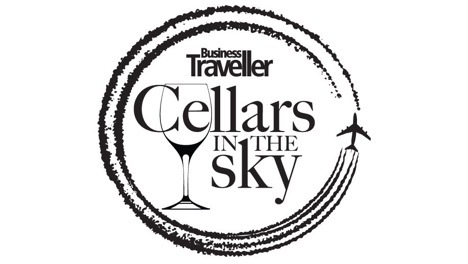 The Business Traveller Cellars in the Sky 2018 Awards, which recognize the best business and first-class wines served by airlines worldwide for 2018, were presented on Monday, February 18 at The Langham, London, by Charles Metcalfe, co-chairman of the International Wine Challenge. Qantas was the evening’s biggest winner, taking the coveted Gold Medal for Best Overall Cellar, as well as the top spots in the Best First-Class White, Best First Class Sparkling (jointly with Air France and Cathay Pacific), Best First-Class Cellar, Best-Presented First-Class Wine List, and Best Business Class Fortified / Dessert Wine categories. Cathay Pacific won two Gold Medals for Best First Class Sparkling (jointly with Air France and Qantas) and Best Business Class Red, while Malaysia Airlines took the top spot in the Best First-Class Red category, ANA won the award for Best First Class Fortified / Dessert Wine, and Qatar Airways took the top spot in the Best Business Class Sparkling category. Oneworld was named Best Airline Alliance, while one of its member carriers British Airways took the Gold Medal for Best Business Class Cellar. And a special note to US low-cost carrier Jetblue, which won a Gold Medal in the Cellars in the Sky competition for the first time, taking the top spot in the Best Business Class White category. Business Traveller contacted airlines in summer 2018, and 33 entered. Blind tastings of 240 bottles took place at London’s Grosvenor Hotel, Victoria, in December, with the four judges independently scoring the wines over the course of two days. Participating airlines were: Aegean, Aer Lingus, Aeroflot, Aircalin, Air Canada, Air France, Air Italy, Air New Zealand, Air Tahiti Nui, American Airlines, All Nippon Airways, British Airways, Brussels Airlines, Cathay Dragon, Cathay Pacific, Delta Air Lines, EVA Air, Finnair, Garuda Indonesia, Iberia, Icelandair, Japan Airlines, Jet Blue, Korean Air, Malaysia Airlines, Oman Air, Qantas, Qatar Airways, Singapore Airlines, South African Airways, Sri Lankan Airlines, TAP Air Portugal, and Virgin Atlantic.